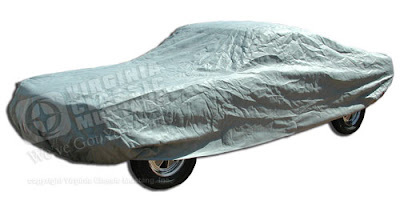 Virginia Classic Mustang Blog: Car Covers for your Mustang! When the company that supplied our Noah™ Car Covers went out of business, we were not happy. That particular car cover has always been our most popular cover. It did not take long for us to find a replacement though. This new one is not only a replacement, it is a slight improvement! This new material for our Mustang car covers is called Mosom Plus™. It is a strange name, but it is a great car cover! Mosom Plus™ is a four layer material. The outer two layers are Spunbond Polypropylene, the middle layer is a special micro-porus film and the inside layer is super-soft fabric. The middle layer is an excellent rain barrier, while allowing for vapors to pass through. The special cotton flock inner layer pampers the most delicate paint finish. It is a great choice for all-around car cover use, suggested for most conditions except extreme sun, snow or ice. Mosom Plus™ is a non-woven material, so in the unlikely event a rip occurs in the material, it will not run. We also have our "budget" Triguard™ Car Covers, the CoverBond 4™ Car Covers for the next step up, and our "high end" new Stormproof™ Car Covers. We have all of these covers for most all Mustang bodystyles from 64 1/2 to 73. CLICK HERE to see them all.